Alam, A.S.M.M. ; Hossain, K.M. ; Hossain, B.; Ahmed, A. & Hoque, M.J. 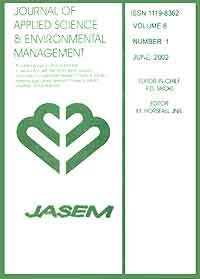 Various types of waste effluents produced by two industries were studied to verify their environmental effects and to prepare a suggestion for management of those wastes. Two types of wastes were considered- wastewater and solid wastes. Analysis on three samples of wastewater was performed to determine the physical, chemical, organic and biological pollution. The pH values were 6.58, 6.75 & 6.64; amount of TDS were 235, 241 & 270 ppm; total hardness were 126, 123 & 144 ppm; calcium hardness were 105, 99 & 122 ppm, all the values of P-alkalinity were zero and values of M-alkalinity were 40, 40 & 45 mg/l. Iron concentrations were 0.21, 0.18 & 0.19 mg/l. Their Cl2 test proved absence of Cl2 Molecule. Only one sample was analyzed for bacterial viable count (44x105 cfu/ml), fungal test (fungi were absent), DO (6.8 mg/l), BOD (156 mg/1) and COD (267 mg/1). Results suggested that iron concentrations, pH values, TDS and DO were within the standard range. Level of total hardness, alkalinity, BOD, COD and total bacterial count exceeded level of standards. Their effects were evaluated from secondary data sources. Solid waste quality and the current onsite waste management facilities were studied through questionnaire survey and direct observations. Most of the cases, current waste management systems were old fashioned and indigenous. After studying literature on waste management procedures, a waste management plan for these industries has been prepared. Study results show that, these selected industries do produce few waste linked problems which can be minimized following some strict management measures.